Joby GorillaPod says “Hello”. Good news: only 1 in 10,000 gains sentience and fires lasers at humans. 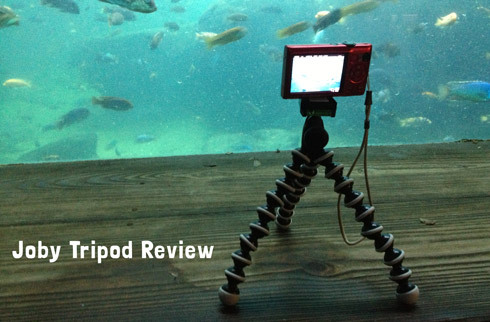 I wrote about my Joby GorillaPod tripod last week in my post “5 Best Tech Travel Accessories” but honestly, this flexible travel-friendly tripod is so awesome it deserves its own review! 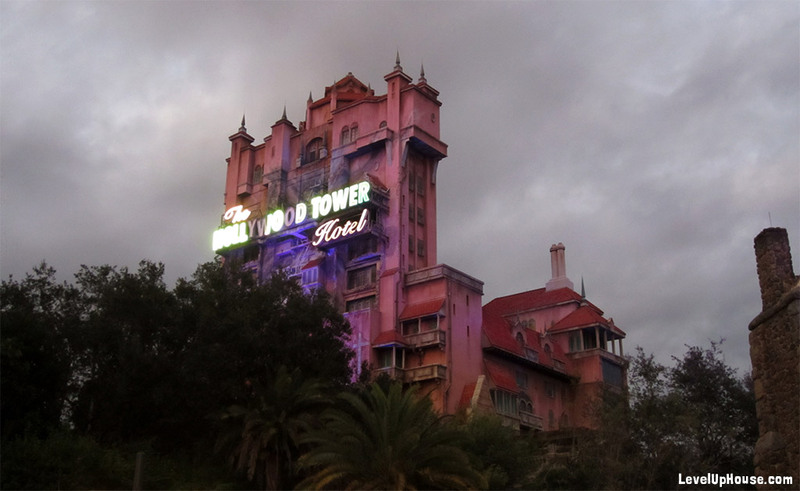 I only discovered it because I was trying to find a tripod compact enough to take into Walt Disney World, and now I’m kicking myself for not getting one sooner! I spent 10 days twisting, posing, straightening, curling, and oh yeah – taking photos! 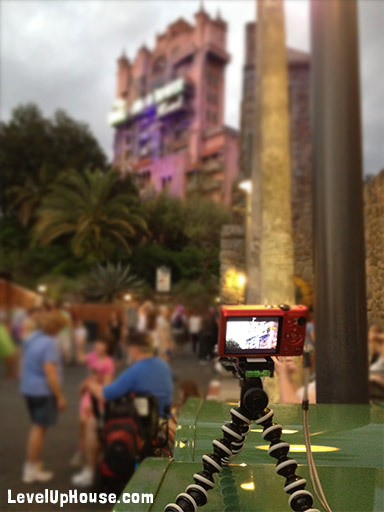 – with my new Joby GorillaPod on a recent trip to Walt Disney World. I’m not easy to impress, usually accessories in the sub-$40 category are a disappointment, but I am actually really impressed! 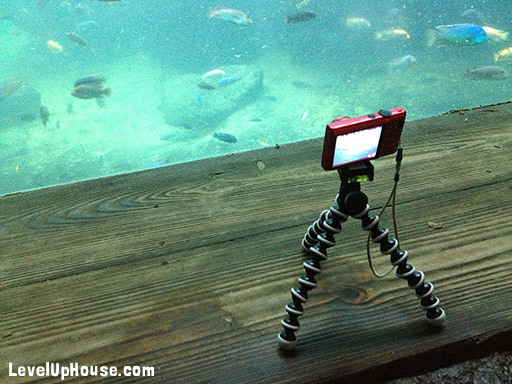 you like to take video – a small tripod is handy for stabilizing your camera! JOBY is a manufacturer of many cool camera accessories. I wasn’t paid or perked to write this, I just think the tripod is awesome! I usually expect <$40 things to be rather flimsy, however this tripod has now survived four flights in my carry-on bag, a week in Disney World, a few craft photo shoots, and a good deal of idle bending and playing with it just for fun. I bent and twisted this thing every day. I even took it on roller coasters. It’s still in one piece! 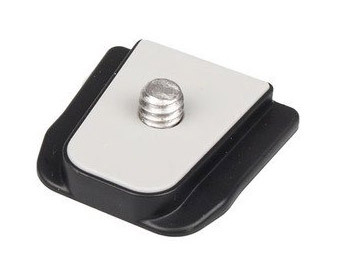 The camera clip-on mechanism feels strong, and the camera sits tightly on the clip’s pad, never becoming loose or falling out of the tripod on its own. Each of its legs is made up of a series of ball-and-socket plastic links. Each “ball” goes into a “socket” to make a stiff chain with rubber feet at the ends, and the rubber rings help with gripping. Close-up of the Joby tripod’s ball-and-socket leg design. It feels pretty rugged to me, especially for something that’s mostly plastic. The best tripod is the one you have with you. 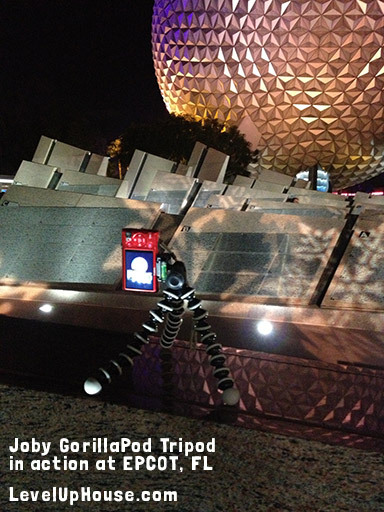 I bought the Joby tripod specifically because I’d be able to bring it into Walt Disney World’s theme parks. Full-size tripods get rejected at the entrance gate, but I wanted to actually get some decent photos in the parks and this tripod totally made that possible (see my photo examples further down). It’s lightweight enough to carry all day in a cinch sack on my back, and I also spent a good deal of time just carrying it around in my hand as I looked for good shots. Everywhere! Once you start looking for places to put this thing, you’ll see the world in a new way. You can even angle the legs and use it as a “stick” for your camera for taking selfies at a bit further than arm’s length. Metal-topped garbage cans were my best friends at WDW: ubiquitous and just the right height. Here’s my Canon + Joby setup working on a video. Tilt camera 90 degrees for vertical shots. Joby sells the quick release clip separately, too, so you can have an extra or replace a lost one. Joby sells spare “quick release” clips in case anything, uh, bad happens to yours. My Joby tripod revolutionized my vacation photos. This section talks about photos I couldn’t have taken without this thing: dusk photos, night photos, group photos, and stable video. Historically, my photos from a trip are iPhone selfies taken at daytime and scenery shots. Anything from dusk is a grainy mess and my photos are nothing to get excited about. I’m not really a “photography enthusiast” (but if a DSLR with nice lenses showed up at my doorstep I would not be sad). I’m sure some of these duh, it’s-this-simple revelations are old-hat to more experienced photographers, but if you showed me these photos 6 months ago I’d have said, “There’s no way I took that, and there’s no way I did it with such cheap equipment”. 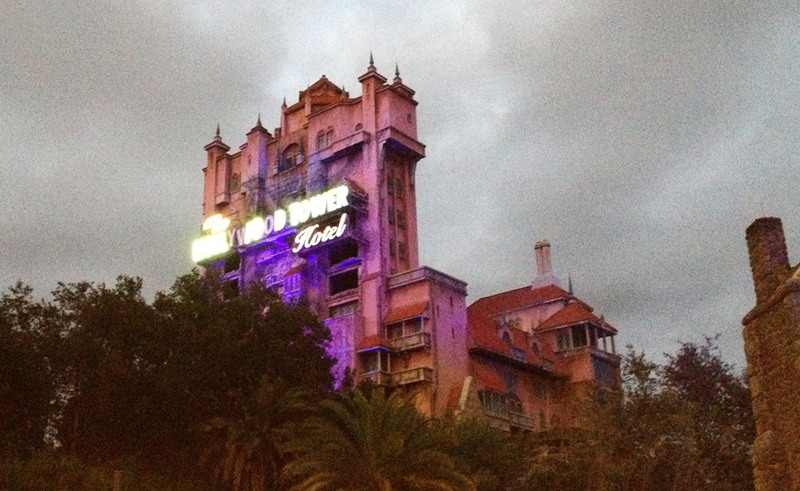 Ahh, dusk. That magical time of day when cameras need to be stabilized with a longer shutter time to take a halfway decent shot. iPhone 4S photo – the typical grainy/blurry kind of photo I usually take on trips, especially at sunset. Same time of day, this time using a Canon point and shoot and the Joby tripod to hold it still. Inexpensive point and shoot camera + small tripod = Oh, my. Wow. Dang. 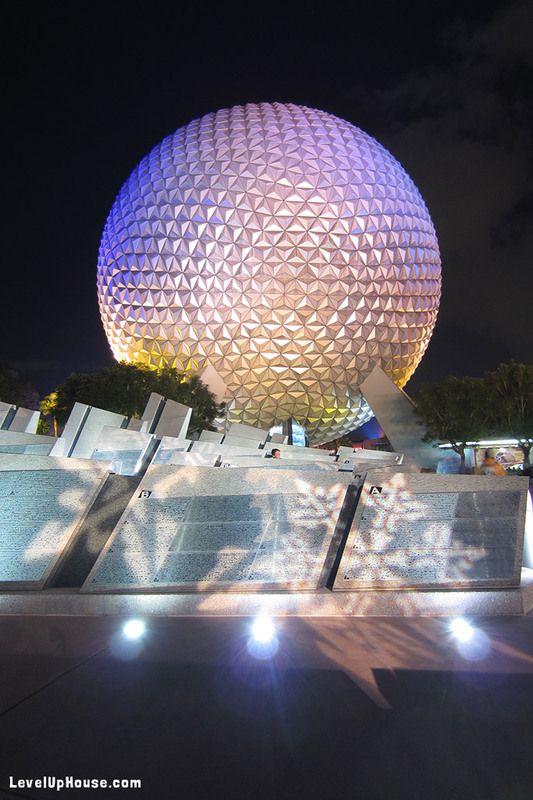 To get a decent nighttime shot, your camera has to be able to hold completely still for a few seconds. Many point and shoots can do this, but without a tripod it’s a lost cause. 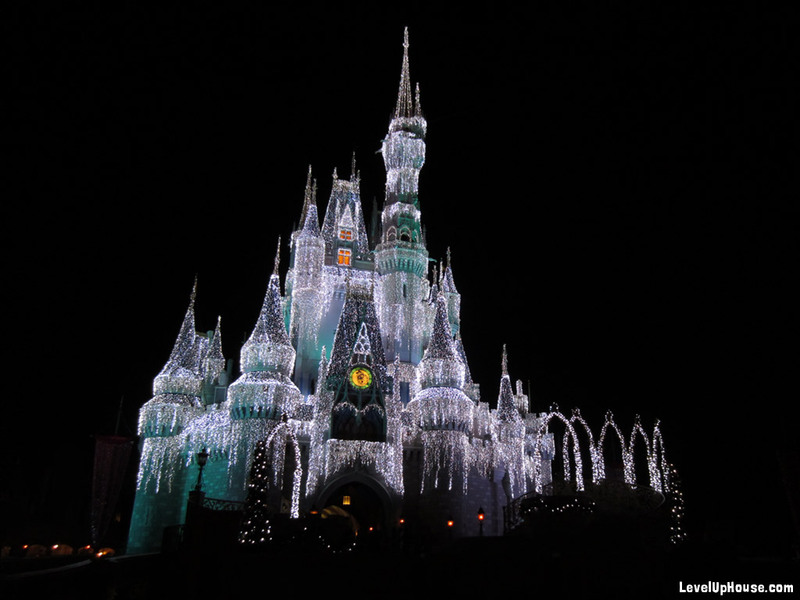 Disney’s Magic Kingdom has a cool castle covered in glowing “icicles” in December, but there’s practically nowhere to set a camera down. I wrapped the Joby’s legs around a railing to get this shot. 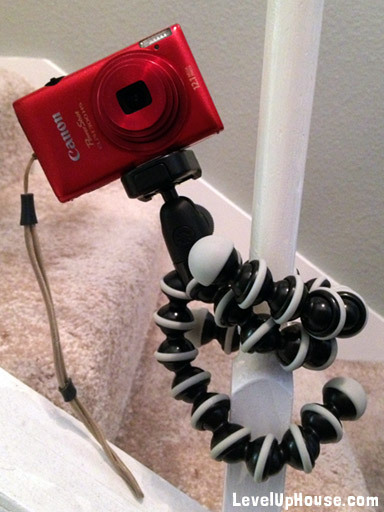 I wrapped the Joby legs around a metal railing to hold the camera steady. This next shot demonstrates how the camera can be tilted 90 degrees to the left (or right) on the Joby tripod for vertical photos. This photo of my Joby doing its thing was taken with my iPhone. The iPhone 4S did better than I expected in this fairly dark scene. But here’s the photo the Canon took with its 3 second shutter time and utter stability. I can’t believe *I* took this photo. So purty! Here’s another luxury we’ve never had before getting this Joby tripod: vacation photos of both of us! Together! Like we know each other and stuff. 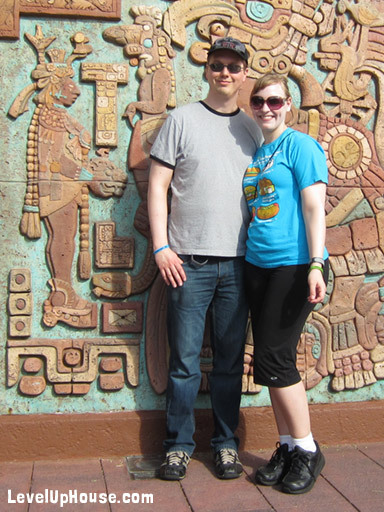 I put the Joby on a half-height wall near the entrance to the Mexico pavilion in EPCOT for this nice shot of Jim and I together. 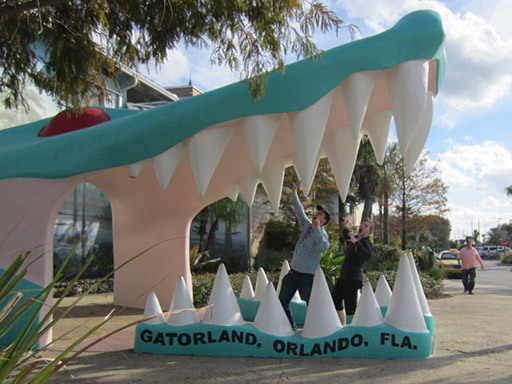 We put the Joby on a nearby fire hydrant (and the camera on a 10 second delay) to create this fun photo at the Gatorland entrance in Orlando, FL. 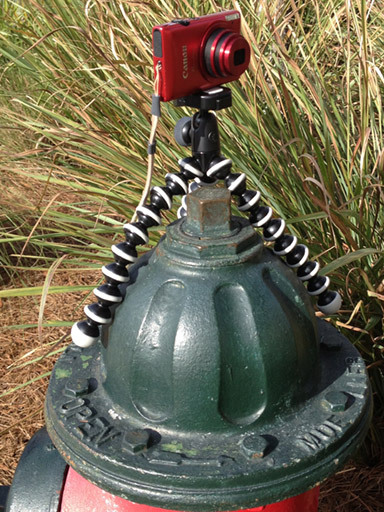 Here’s how we set up the camera for the Gatorland shot. Fire hydrants and railings make really good Joby stands. Here’s the video – silky smooth. 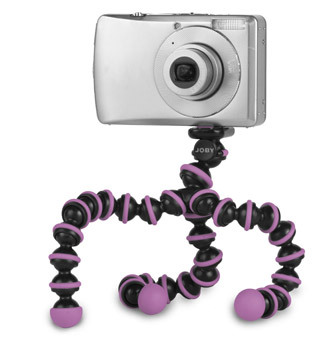 The Joby GorillaPod Original comes in a bunch of colors. Alas, the Original is the “light-duty” model, capable of holding only small cameras (up to 9 ounces). While my review is specific to the Joby GorillaPod Hybrid Grey (follow Amazon link to see the exact model), there are more Joby models to pick from. The key difference between the models is the amount of weight that can be supported without sagging, though there’s also a neat-o magnetic version that only holds lightweight cameras. HOW LARGE IS YOUR CAMERA? If you’re using a point and shoot camera the Original or the Hybrid are both sufficient. I went “up” a strength because I might upgrade my camera someday, and because I liked the reassurance of having more strength than I really needed. Note to readers: I’m not affiliated with Joby, I just think their product is super awesome. Some links are Amazon Affiliate links – a small % of your purchase (if you make one) helps support this site. As always, I encourage you to shop around and price compare to be sure you get the best deal!